Crime Doesn’t Pay in Norway: Muslims Furious For Being Served Pork……. – The Tundra Tabloids……. 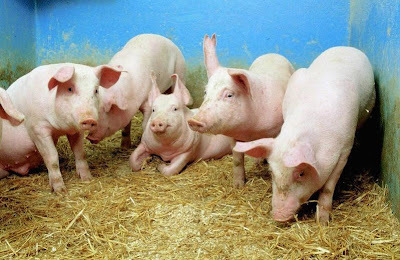 Crime Doesn’t Pay in Norway: Muslims Furious For Being Served Pork……. Aftenbladet : A muslim prisoner at Trondheim prison has reported the prison for discrimination, after muslim prisoners were served pork without being told. Muslims reacted strongly when they discovered they had eaten pork, which is forbidden for muslims. «We were given fish in bread-crumbs. While we ate, someone discovered small pieces of pork in the sauce that was inside the fish. Many here pray and practice their religion more than me, and several of them were furious when they found out they had eaten pork,» says the 39.year old Salma to Adresseavisen. He has reported the prison on behalf of himself and the other muslim prisoners. MP, Solveig Horne, who is a member of the Justice Committee, says on the party’s home page that special diets behind bars should be refused. «There are already limited resources in the prison unit. We shouldn’t use time, money and energy on making room for special diets for some prisoners, based on religious convictions, culture, or taste buds, for that matter,» she says. Horne thinks that certain muslims, who want to live in accordance with the Koran, are more concerned with food in prison than with not commiting the criminal acts that send them there. Abid Raja of the Left-Wing Party (Venstre), thinks the most practical thing would be for the prisons to serve only halal-meat. «Norwegians have no problems eating halal-meat. If they want pork, they can have this as an addition,» he says to Dagavisen. no. He points out that pig is shameful for many muslims, and that eating pork for some muslims feels like abuse. More than a third of all prisoners in Norwegian prisons are muslims. There are no prisons in Norway that offer halal-meat to prisoners. Previous Post Previous Post Britain: Catholic Bishops Bowing to Islam Deserve Swift Kick……. Next Post Next Post Norwegian Comedian Who Burnt Copy of The Old Testament Jokes About The Holocaust……. But I respect people who don’t eat ham or pork because of religious beliefs. In this context however, I think bread and water is the solution. Make sure the bread is whole grain and so not stripped of vitamins. Pure water to supplement the bread. Oh yes, and throw in a handful of dates for dessert, once a day. But let’s not discriminate. Make the diet the same for everyone. Don't do the crime if you can't eat the swine!